Artist Paul G. Russell revises his notes. Photo by Matt Kim/Torontoist. The question of whether Paul G. Russell’s career is more transom than mullion, more bridge than pillar, is a tough one. His achievements span virtually every artistic medium—from writing to television to film to stage to art—yet each are significant contributions atop which Canadian culture continues to build. Paul Russell first studied art history at the University of Toronto. It was during this time that he also took studio classes at Hart House under Canadian artists Will Ogilvie and Aba Bayefsky, before pursuing further studies at the Courtauld Institute, St. Martin’s School of Art in London (now Central St. Martin’s College of Art & Design), and Whitechapel’s Sir John Cass Department of Art and Design. 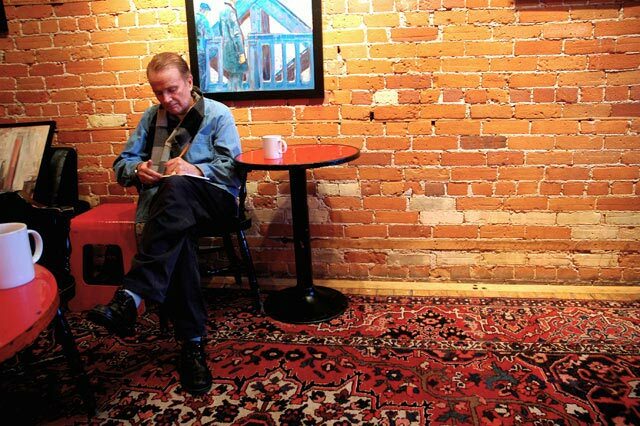 In his long career, he’s penned a novel (Queen on Moose Handbook) as well as an extensive list of articles for publications such as The Globe and Mail, Canadian Art Magazine, and Maclean’s; produced musical theatre shows staged in Toronto, Jacques Brel, and Dames at Sea amongst others; and the CTV series Untamed World. He’s currently the executive producer of the high-school version of Jeopardy, Reach for the Top. Since then, Paul has been exploring what he has come to realize is, and has for a long time been, a reoccurring theme in his work: bridges. “It is the link, the connecting line between two points, the leap of imagination, the leap across space or time, the link between opposites, or the treaty that resolves conflict,” he says. “We call a bridge by many names: a causeway, a covered bridge, a bailey bridge, a trestle bridge, a rope bridge, a cantilevered bridge, a link, an overpass, a vault, an arch…a meeting of minds, an olive branch, a peace treaty, conflict resolution, love, forgiveness.” Torontoist was able to sit down with Paul recently and chat about his solo art exhibition. “Abridged: Paintings by Paul G. Russell” is at the Art Bar in the Gladstone Hotel. But don’t wait; it closes on Wednesday, April 15. Torontoist: You had a realization recently that bridges were a dominant theme in your work. Paul Russell: Yes, that was last year. I realized when I was going through some stuff that I had done quite a lot of bridges (laughs). Well, they are compelling and they are picturesque. In your artist statement you mentioned exploring bridges as structure, as landscape, and as metaphor. What is it that you’re trying to traverse, metaphorically or otherwise, in your work? Well, as an artist you’re always trying to span the abyss between you and the audience. You’re always looking at your work, to clarify what you intend to get across or else the viewer might see something you didn’t intend. But that’s something you have no control over. You try. This one (points) is called “Saying goodbye,” and it is about the funeral cortège from Trenton to Toronto honouring soldiers who died in Afghanistan—a bridge of collective and individual emotion, sad and proud, over a procession of cars speeding along an expressway. And this is called “City Links.” It’s Blackfriars Bridge in London, which is now gone, just pillars left in the river. So you have this bridgeless bridge, which is very striking when you first see it because there they are, the piers and they’re holding nothing up. They’re just there. Most of your paintings here are of manmade bridges, though you have one here representing a natural bridge, a fallen tree. Do you think the impulse to traverse is innate? Very much. Especially when you’re a child. The sheer excitement going across something that seems as if no one has crossed before. You can always go down the side and slosh through the creek and go up the other side, but if there was a fallen tree…that would be much more exciting. Another thing you touched upon in your artistic statement was the experience of going under or over a bridge. How is this manifest in your work? Well, it’s interesting. The trestle bridge just outside here [on the corner of Queen Street West and Gladstone Avenue]—we’re all going under it, not going over it. We don’t even think of it as a bridge; we think of it as an underpass. Its like a graffiti-covered portal that we go through. Bridges are also transitory experiences. Do you think about the transient nature of the bridge? Bridges are scenes of tragedy, scenes of romance. People do meet on bridges. [Bridges] are very old, certainly in Western mythology. There wasn’t always bridge—a ferry boat ‘bridged’ the River Styx. There’s a sense of that gap somehow to be crossed—various cultural, coming of age rituals, some sort of ordeal you have to go through to get to the next phase of your life. So, does this come at certain juncture in your career? I think that having an exhibition is a juncture. It probably summarizes what you’ve been doing over the recent past and hopefully points to a future direction. So what’s on the other side, what’s next for you? Well, I want to do more painting, but not bridges. More about time—the passage of time, imagery of people moving through time. I haven’t worked out what it’s going to look like yet, but the next series I’m working on focuses more on people, less architectonic.